When I asked Junoon’s Pastry Chef, who started in September 2010, whether she had to get approval from Executive Chef Vikas Khanna to add a new dessert to the menu, she responded blithely “not really, he trusts me”. This anecdote speaks to the way Jenny Lee approaches her desserts at the one-Michelin-starred Junoon. She seems to start with a mostly blank canvas and adds whatever elements she thinks will work to make the dish special. 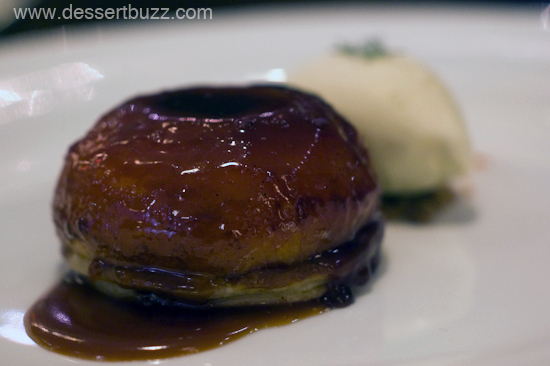 The quince tart tatin is a perfect example. This dish is really tart. I mean, punch-you-in-the-jaw tart. She could have easily just sweetened it up to taste like a Del Monte fruit cocktail and I’m sure some customers would have been fine with that. Instead, the tart quince flavor was allowed to shine though. 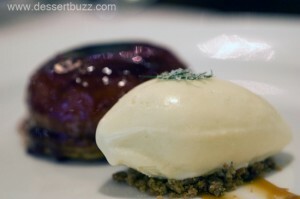 The subtly flavored fennel ice cream takes a bit of the edge off to complete the dish. The chef calls her new chocolate parfait & semifreddo dessert a “hi-end Klondike bar” and I think that’s a great description. This plate features a nicely spiced chili ice cream along with a chocolate cookie and hazelnut brittle that surround the parfait. It’s served like a semifreddo rather than a traditional parfait in a glass. 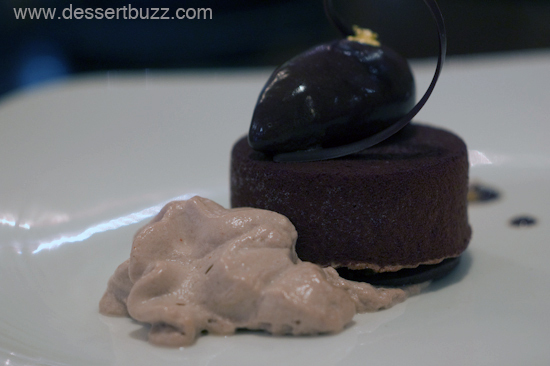 Next to the chocolate tower is small serving of 66% gianduja and chili cream. 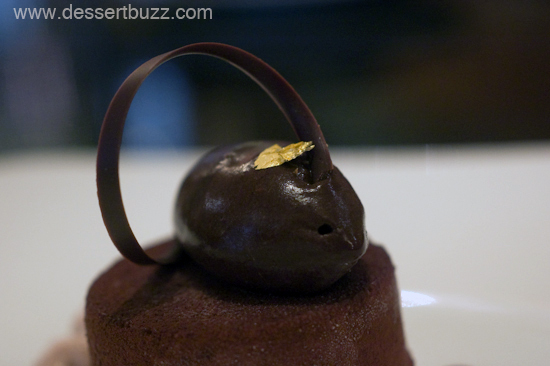 Cocoa powder is sprayed on at the end to create the matte finish all the better to contract with a gold leaf garnish. 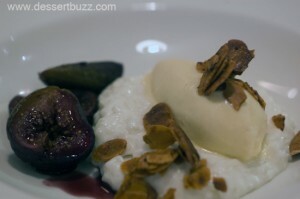 It was hard to choose my favorite dessert offering but the silky smooth coconut rice pudding won me over because it achieves the rare accomplishment of being a fancy-pants plated dessert but is also very much a comfort dessert (like a warm bread pudding). The rice pudding strikes a nice sweetness–that is–not very sweet at all. Ms. Lee is quite thoughtful with this dish as she uses Egyptian rice because it’s not as absorbent as other varieties. The almonds are soaked in a wine-sugar mixture and then roasted, leaving them with a crunch as powerful as a potato chip. Her ginger ice cream is one of the best I’ve had in recent memory. Instead of making the ginger so hot that you can hardly taste anything else, or worse making it so mild that it might has well be supermarket ice cream, she brings it up to just the right amount of heat. Ms. Lee told me she is a fan of Nancy Olsen’s desserts from Gramercy Tavern as well as Spot Dessert Bar when it was run by Pichet Ong (she hasn’t visited since Ian Chalermkittichai took over the menu). She also like Paris Baogette. 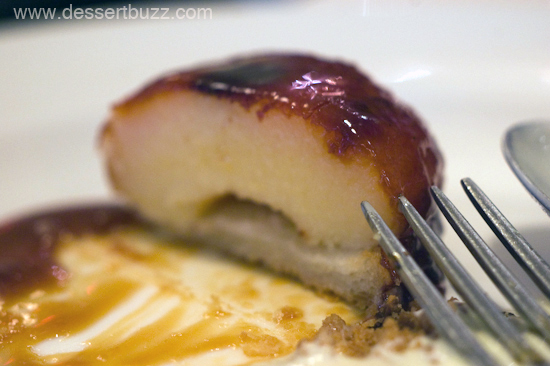 All the desserts I tried from Junoon were inventive and interesting, however, each dish has at least one element that ties it back to the restaurant’s Indian menu. I recommend visiting the lounge area on a cold night and warming up with a plate of coconut rice pudding. Junoon is located at 27 West 24th Street. Their website is here. Follow DessertBuzz on Twitter. Looks awesome! Great food sensory!